Pattan’s Pumpkin is an Indian flood story, reminiscent of the traditional Noah’s Ark tale. It is the story of Pattan, a kind and caring man who stumbles upon an ailing flower and decides to plant it near his hut and nurture it back to life. Pattan watches the flower gain strength and its yellow flowers blossom in the glorious sun. One day, to Pattan’s surprise, he notices that the flower has transformed into a magnificent pumpkin that is bigger than the goats, bigger than the elephants, and is actually so tall that it reaches the summit of the mountain. When a terrifying storm arrives and the waters rise, Pattan’s quick thinking and imagination help him devise a clever plan that enables him to rescue the whole village from impending disaster. 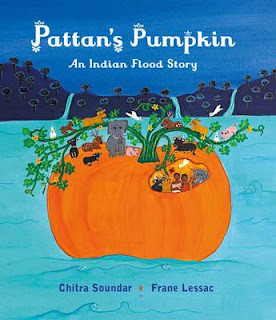 Pattan’s Pumpkin is written by well-known author, Chitra Soundar, who was born and raised in India, a place where traditions, festivals and mythology are a way of life. Over the years, Chitra has produced a wonderful array of books in various genres. The illustrations by award winning artist Frane Lessac are striking and vibrant, and the colour palette is so rich that the images practically leap off the page. Pattan’s Pumpkin is a sweet tale for readers aged 4-8 years. The text is easy to read and has a soft, gentle tone that will soothe young readers at bedtime and have them happily dozing in no time at all. Pattan’s Pumpkin is a beautiful book and the perfect addition to your picture book library.